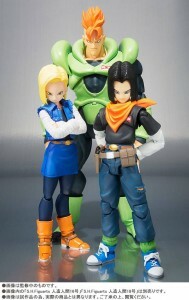 If there was one thing to make sure I buy both Figuarts Android 17 and 18 it would be the release of this figure. It’s another large scale S.H.Figuasrts toy based on Android 16. Android 16 was probably one of the coolest characters in the Android saga and so far we haven’t had a lot of good toys based on Android 16 other than a few statues. As far as accessories we don’t know what he could come with but it’s likley to be a few heads including a battle damaged one. He’s taller than the other Figuarts toys released so far and looks to be a little bit small than the upcoming Super Saiyan Broly Figuarts toy.